There is a tourist trap in Dillon, South Carolina called South of the Border. A combination truck stop, motel, roadside attraction, carnival and snack stand, it is also a wonderland of Mexican stereotypes, hosted by the official mascot, Pedro. “South of the Border,” was founded by Dillon-native Alan Schafer. In the mid-to-late 1940s, a North Carolina county bordering South Carolina changed its alcohol licensing laws, limiting sales. Schafer seized the opportunity by setting up a beer stand not far from the South Carolina state line. The property he bought was near the north-south highway connecting New York and Miami, which later would be replaced by Interstate 95. In this ideal location, Schafer’s beer business expanded exponentially over the years to become “South of the Border,” with Mexican-themed amusement park rides, hotels, restaurants, and gift shops. 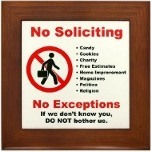 Schafer put up 120 billboards along the interstate in both directions advertising for his kitschy tourist attraction. 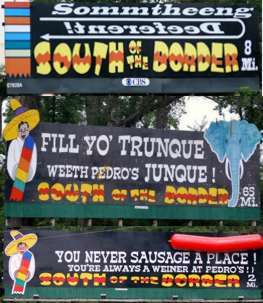 Anyone who drives North or South along Interstate 95, through the Carolinas, cannot miss the billboards to stop at South Of The Border, represented by a cartoon character named Pedro. 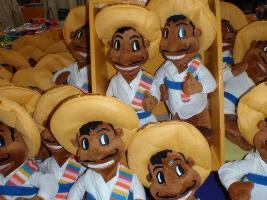 Pedro is the stereotypical Mexican amigo who serves as South of the Border's mascot. “Pedro” began when Mr. Schafer went to Mexico to make import connections. As he began importing Mexican souvenirs he also arranged for two Mexican boys to come to America and work for him. “Somebody began calling them Pedro and Pancho,” he said. “And since it fit into the theme, we began calling them both Pedro.” Today, all South of the Border workers, regardless of race, are called Pedro. Even though Schafer died in 2001, South of the Border’s many Pedro statues still welcome motorists today. Meanwhile the buildings, rides and other infrastructure have suffered a long decline in maintenance and decay is everywhere. This place was cute in the 1950s and 1960s, but the fact that it still exists is a sad commentary on just how little sensitivity there is among the general public to the demeaning nature of racial caricatures. The grinning Pedro is not just a cute mascot. He evokes several unflattering stereotypes.